Lightweight quilt lined winter overall. Polyester with PU-coated inside for water and wind resistance. Two-way zip with storm flap up to collar. Breast pockets with flap. Napoleon pocket under storm flap. Side slant front pockets. Back pockets with flap. Inner pocket with phone compartment. Elasticised waist. Internal knit cuff in sleeve with thumb grip. Zip up to hips on legs. 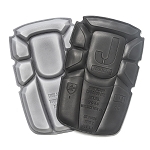 Internal kneepad pockets. Reflective strips on leg. Rubber-coated buttons.